Bookclub! One of my favorite things ever. Last night, we met to discuss William Landay’s book Defending Jacob. The book was twisted. I think I was the only one who didn’t love it, but I did like it. I enjoyed the curves in the story and the way it left so much to think about. We had a great discussion about it, and we realized that there are lots of ways to interpret the story and what happened to the family. It was a great book to talk about, but I would not want to read it without a group of friends to bounce ideas off of. Thank goodness for bookclub friends. We also, of course, ate great food. My mom made her now famous asparagus via Trisha Yearwood. We also had homemade pimento cheese, chicken salad from Sam’s, and lots of fresh fruit. Devine. Dessert by our hostess was lemon ice box pie ice cream from Southern Living. Amazing. I made a few new dishes since I had the time to try something new. Another reason to love summer, I say. 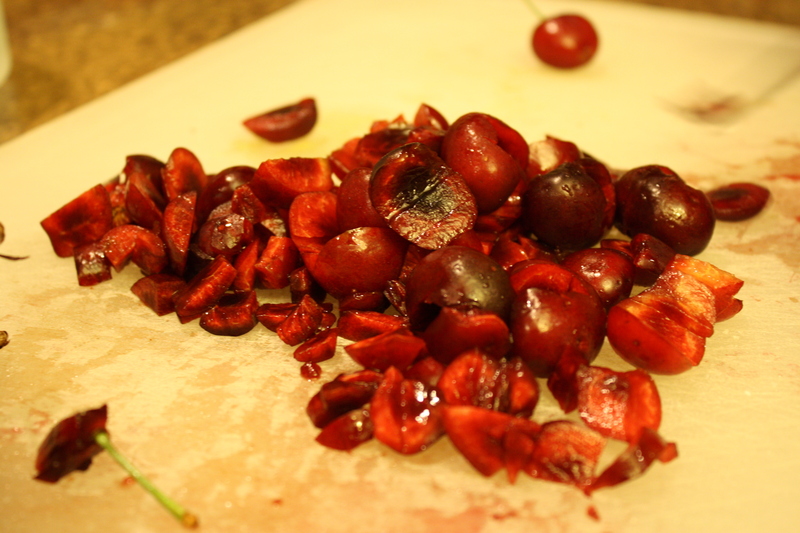 First, I made Rachael Ray’s Cherry-Mozzarella Crisps since I found good looking fresh cherries at Wal-Mart. The recipe was easy. 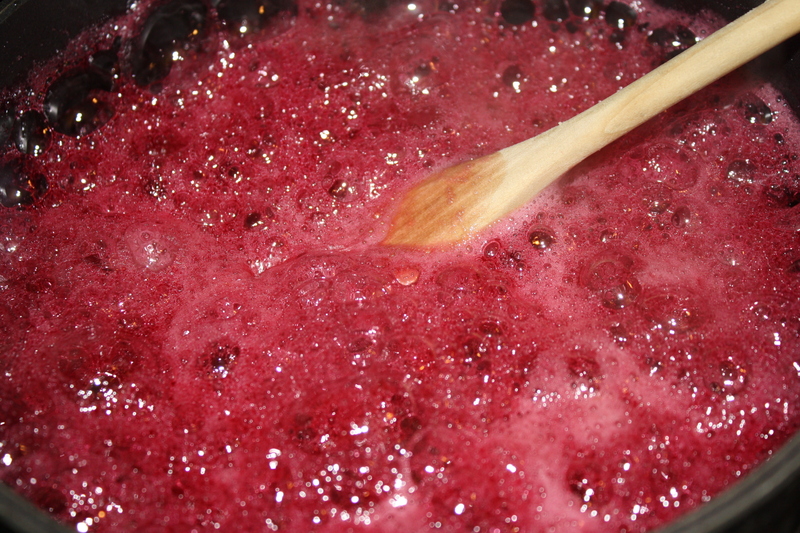 The cherries turned into this beautiful color and sweet sauce. Next time, I would flip the bread before I topped them with the cheese, because the bottoms were a great golden brown color while the tops looked kind of greasy from the olive oil. Too bad I figured that out too late. When I took them to dinner, they were not as good as when I tested them at home while they were hot. They were still interesting, though. 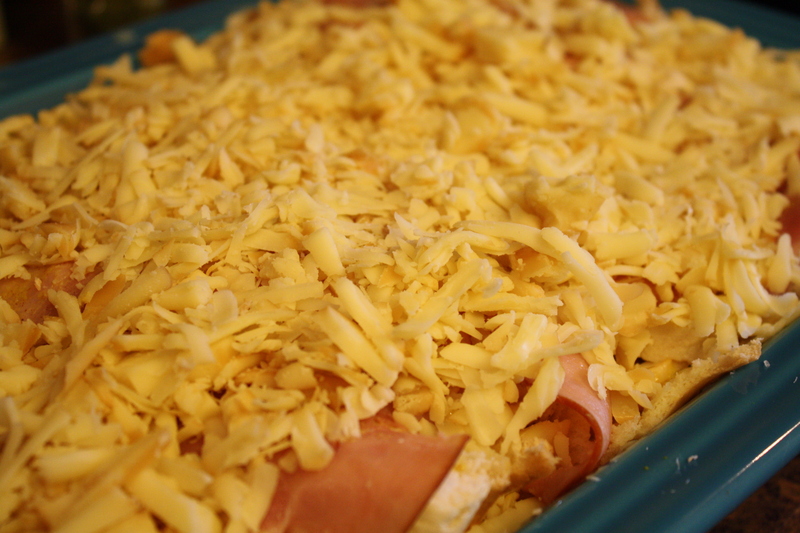 I also made a Monte Cristo Strata from Food and Wine. It was a hit, and it was easy. I got everything I needed from Kroger’s deli counter and used smoked Gouda. Easy. I assembled the dish then let it sit in the refrigerator to absorb all the juices for about an hour. 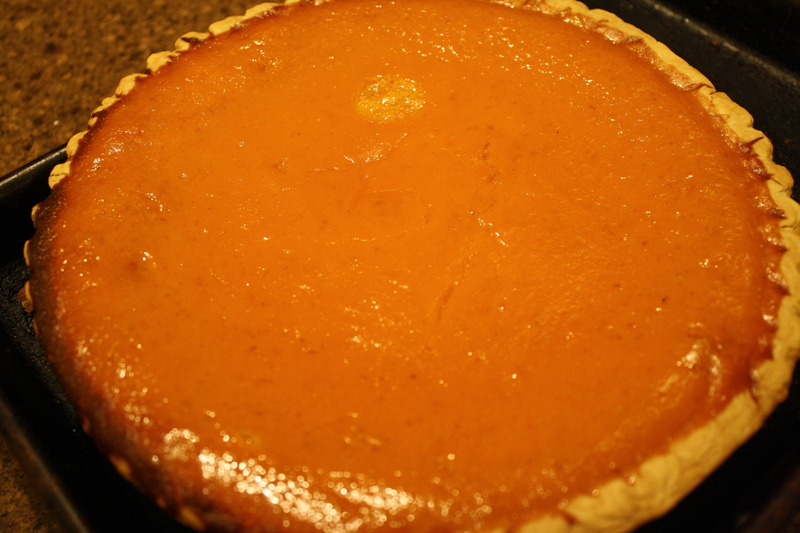 I also adjusted my baking time to about 45 minutes to make sure the middle was done. A friend of mine at work recently gave me a gallon size bag of fresh blueberries. Her dad was given some, and he passed them on to her, and then she passed some on to me. Did she give them to me because she is a good friend, or because she knew I would try to make something with them and that I would share that attempt? I think we all know the answer to that one. A little bit of both. I adore blueberries, and I have never seen any so fresh. We have blueberries at the grocery store here, but they are blue yet bland. These were the real deal. Other than pancakes, which aren’t really shareable except on Saturday mornings in your pjs, I was at a loss for what to make that I could share with my friend and the rest of our staff. What to do? Time to break out the cookbooks. I looked at several, but other than the previously mentioned pancakes, I found nothing. Inviting my co-workers over for a slumber party was going a little over board, I thought. Luckily, my girl Trisha Yearwood had an idea. Really, her sister contributed the recipe to the book, but Trisha’s pic is on the front of the cookbook, so I give them both credit. Anyway, I decided to tweak the original and mesh their recipe with my own. I added quite a few more pecans than the sisters did. The original only calls for 1/2 a cup, and I probably added closer to a cup. I like to have plenty of pecans in a dish so that it is clear that pecans are in there. Otherwise, it just looks as if dirt or some other unfortunate particle has entered the food. More pecans = no pecan/dirt confusion. I also doubled the original and converted it into a bundt cake. It was very pretty that way, but the icing slid into pools on the side. Regardless, everybody at work ate it. Like I have said before, that is not really an indication of a delicious recipe since any food left in a teacher workroom will be promptly eaten no matter its condition. The blueberries were so plump and pretty, and the cake was very moist. It lacked lemony-ness, I thought, but no one else complained. I made the same recipe loaf style the second time I made it. I used the same method of operation, but I baked it for about ten minutes less than the recipe called for. I also doubled the glaze recipe to add more lemon to the mix. 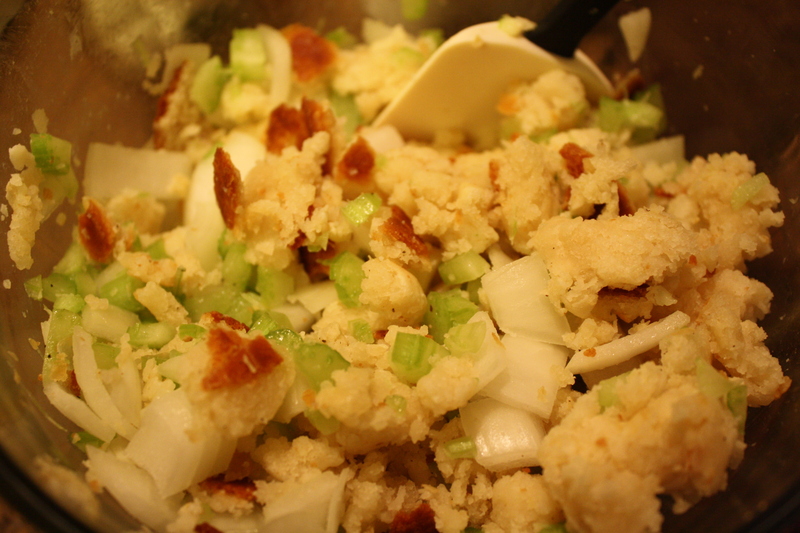 The dressing before the oven-an onion, two stalks of celery, salt, pepper, a pan of biscuits, and a can of chicken broth. Still striving for dressing that is crunchy and flavorful like my grandmother’s. Maybe someday I’ll get there. 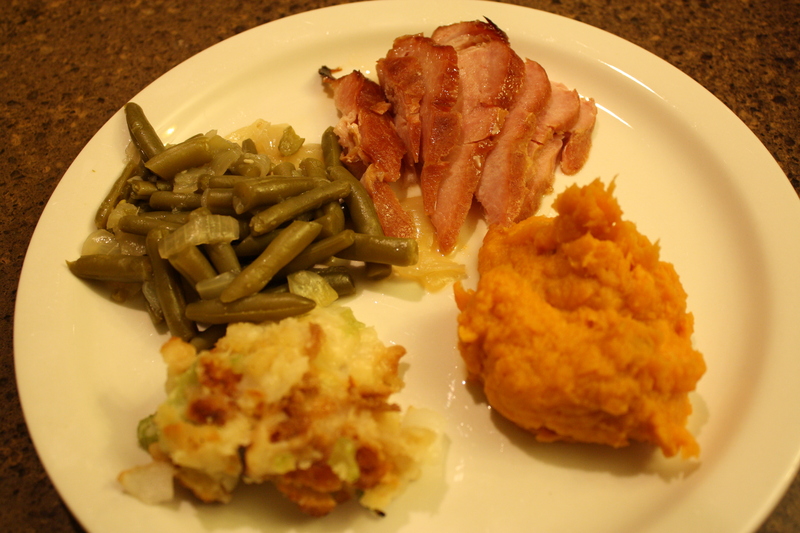 Last year, I made my first Thanksgiving meal for our little family. Just the four of us did it again this year. We sat around our table and ate and ate. It was a good meal with a lot of improvement to go. I made a ham for the first time, and I made mediocre dressing for the second or third time. I tried to make a good Thanksgiving, and no one complained even though they probably could have. Still, we had food, and a table, and all of us were back again to eat our second Thanksgiving meal in our home. Thursday we will eat again with our extended family, but that meal won’t come close to this one under our own roof with just us. Luckily, it is not always about the food, but instead it is about the people who sit in front of it. For that, I am thankful. runny and poured it over the ham with half the time left to bake. 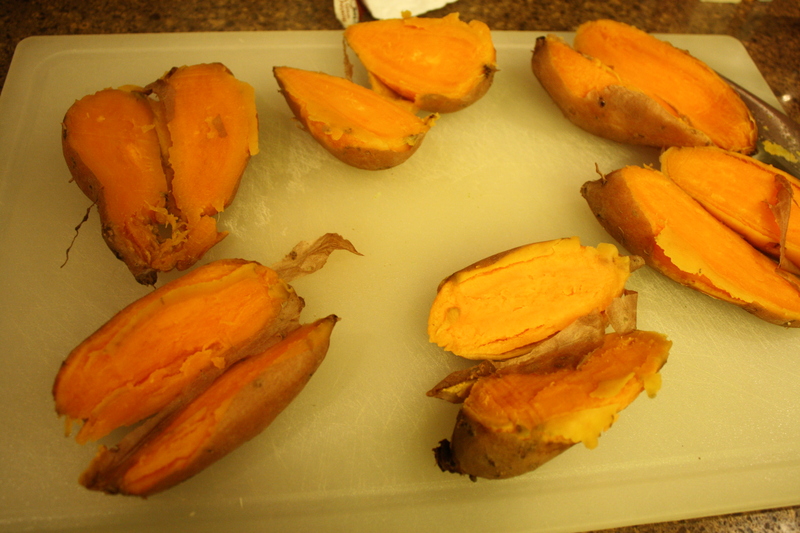 Sweet potatoes that had been boiled for twenty minutes and set out to cool. The skins fell right off. 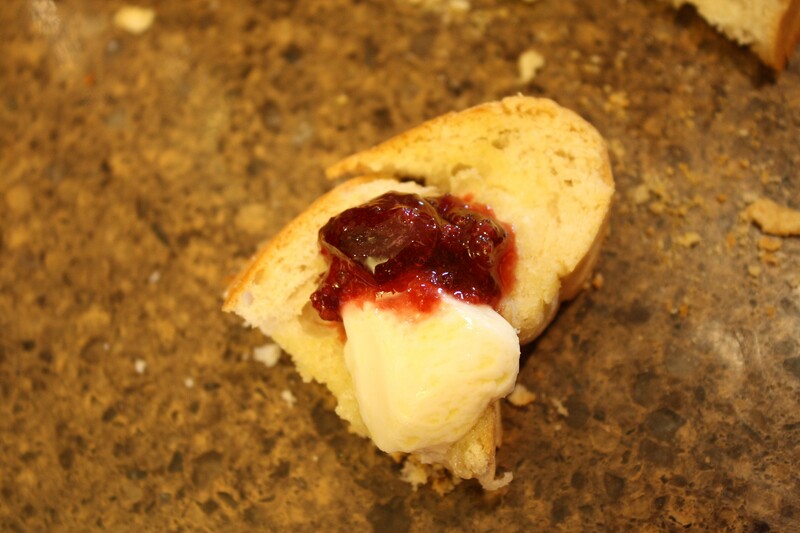 Then, they were whipped with three tablespoons of butter, a dash of cinnamon, and 1/4 a cup of sugar. minus most of the spices and baked at 350 for 1 hour 15 minutes. Simple, simple, simple. 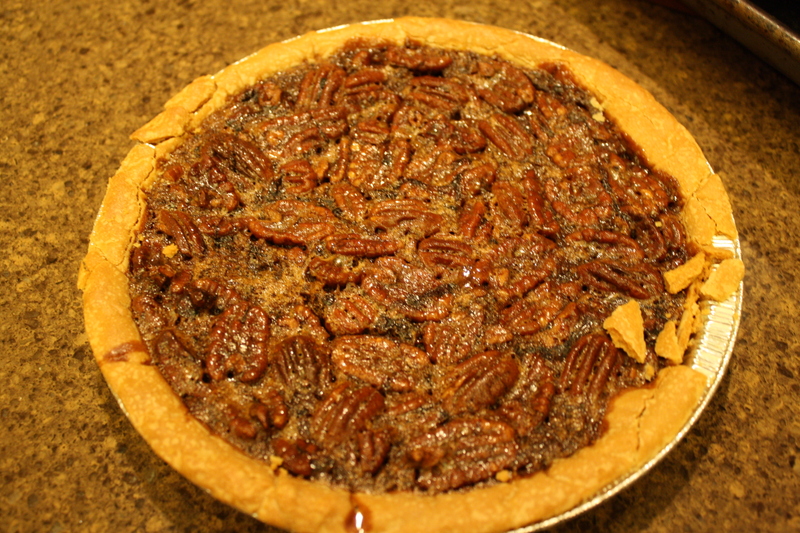 The pecan pie from our library’s bake sale. Smart to have it right before Thanksgiving. I don’t know who made it, but it was divine. My plate without the roll. In September, our book club met at my house to eat and talk about Donna VanLeire’s book The Good Dream. When book club is at my house, I am a total spaz. A bad book club meeting is a downer, and I could not live with myself if a bad meeting happened at my house. I hadn’t had book club at my house since August of 2011. I stressed to the max. When my friend Amanda had book club at her house this summer, I kinda made fun of her for painting her front steps before our meeting. What did I do before it was at my house? We sodded our yard, and I build two brand-new flowerbeds. Not that we have bad get-togethers often, but the guilt of a terrible meeting with ugly flowerbeds and bad grass would be overwhelming. Book club is too much fun to blow it by not being a good host. Of course, though, I had nothing to worry about. My book club friends are amazing people. I believe we could have a good time and many laughs at a funeral. Another thing, the book was great. I loved it. The Good Dream was one of those books that I thought about even when I wasn’t reading it. I pondered the characters and what their fate would be. The ending fit the book very well. Also, the food was divine until we got to dessert. We never eat bad food anyway. 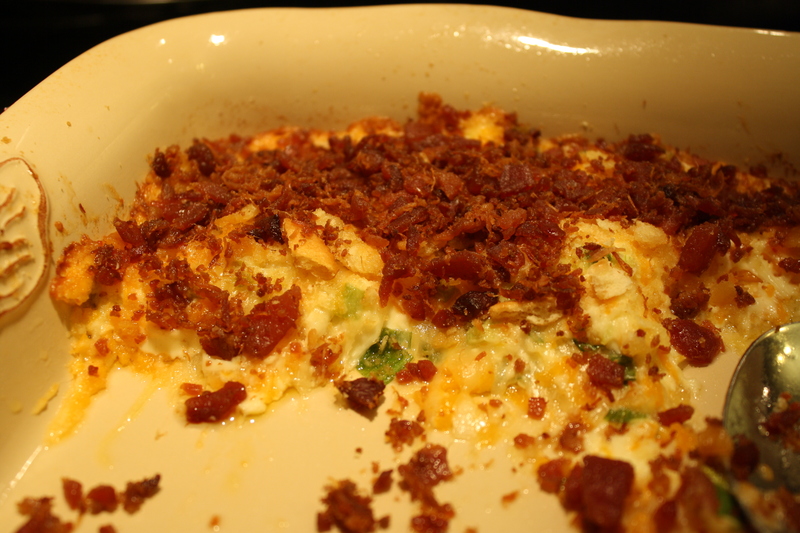 I fixed Trisha Yearwood’s Charleston Cheese Dip, and it was easy and so, so good. I could have eaten it out of the dish with a fork. It was cheesy, yummy, warm and good. I also made Paula Deen’s spicy tomato soup, but that was no big deal. I make it a lot. My friends brought beer cheese, pickled asparagus, and some neat dips. Everything they make is out of this world good. I also made cookies since they were well received last year. I think I may have shared here about my cookies before. My cookie recipe, friends, is the recipe that I shall take with me to the grave. I kid you not, although I have been thinking about sharing with someone so my recipe could be shared with Miss Helper if something were to happen to me. Morbid? Maybe. But listen, these are awesome cookies. 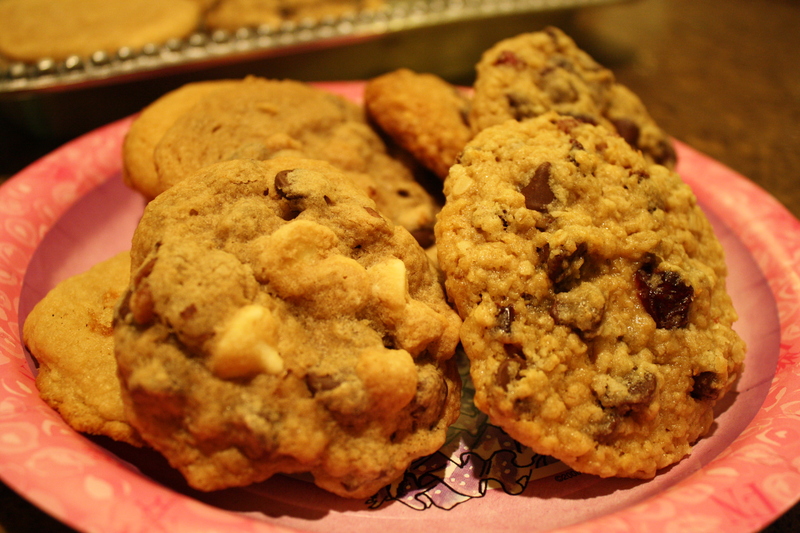 I made chocolate vanilla pecan peanut butter cookies and chocolate oatmeal cranberry cookies. For dessert, I made a caramel cake. Twice. 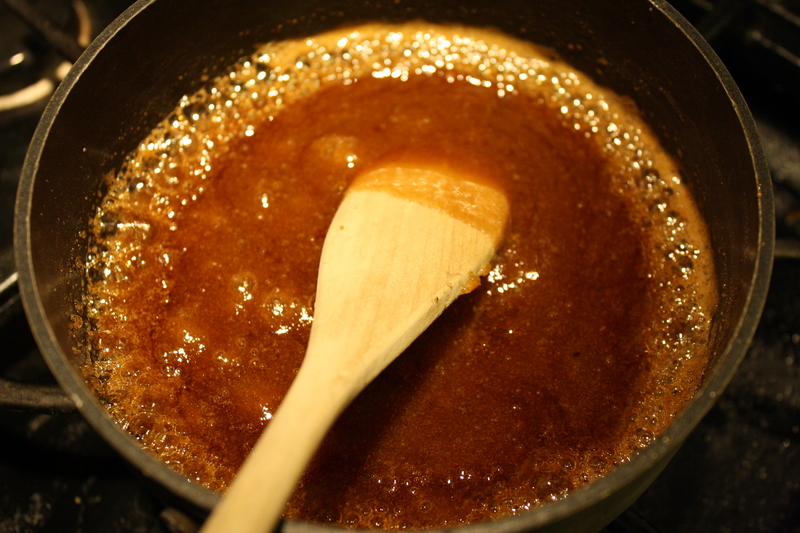 In the book, the main character makes a caramel cake to share with a visitor. She makes a lot of food in the book, and those dishes are all homemade, memorable foods for her. I liked that. When she made the cake, it explained in a little extra detail how she made it. So, based on inspiration from the book, I decided to make a caramel cake from scratch using my “friend” Trisha Yearwood’s caramel cake recipe. The day before book club, I made the twin round sheet cakes and the icing to cover them. The cakes were almost crunchy. They should have spent at least ten minutes less time in the oven. When I realized this, I thought maybe the icing could save the day. When I read the icing recipe, it called for sugar to be melted in a cast iron skillet. Welp, I read and reread that part, and I had never heard of such. The recipe included a stick of butter, and I just figured that it was a typo. I decided that the butter should be melted with the sugar and that my “friend” Trisha had just made a mistake. Have you seen Trisha Yearwood cook? The woman is the real deal. She doesn’t make mistakes. She is the Chuck Norris of the kitchen. Nope, the mistake was all me. My cake icing was as thick and crusty as gloop. But, again, I thought it would all work out. I iced that cake and took a good, hard look at it. It looked nothing like the picture in the cookbook. Not even close. Then, I tasted it. Rather than go with it, I chunked it in the garbage. I had a book club meeting that I could not ruin with a crunchy, gloopy cake. Before book club and after school on the day of book club-no pressure or anything-I rushed to the store and bought a Duncan Hines caramel cake mix with a tub of Duncan Hines caramel icing. A cake has never been put together so fast before. It was record-setting, I tell you. Last minute cake making should be an olympic sport. The second cake was fine, even if I was slightly embarrassed to admit it was a box mix. My friends didn’t say a word. It was a great meeting with great food, a great book, and great folks. I was saved-until next time at least. “I am not going to like it, but I will eat it.” -Mr. Opinionated right before supper. The weather is turning. Saturday is the first day of fall. I love it. Rain has fallen all day, and the temps are cool. 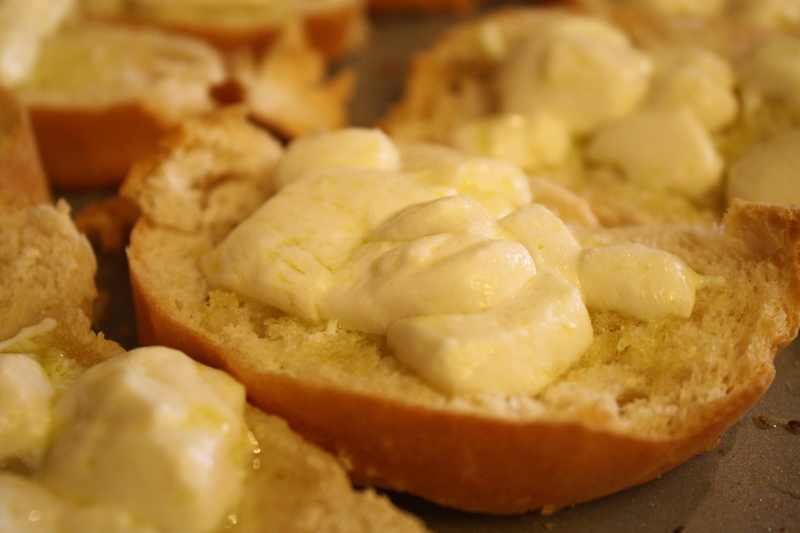 This kind of weather makes me want to devour anything warm and creamy and cheesy and gooey. 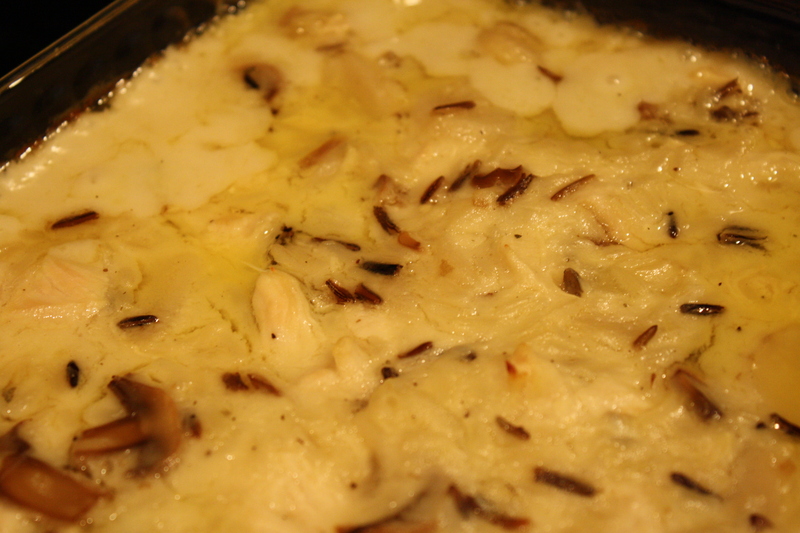 So, I made Trisha Yearwood’s wild rice and chicken casserole. The only thing is that I only had one box of wild rice, and the recipe calls for two. I was supposed to half the whole recipe, but at times I forgot and I added the ingredients as the recipe said. So, it was about half right with lots of extra parts.For example, I added two jars of mushrooms, and I made all the sauce. Devine. Still, this chicken recipe that my husband was not at all excited about made me one happy gal, even if it wasn’t the way Trisha intended. 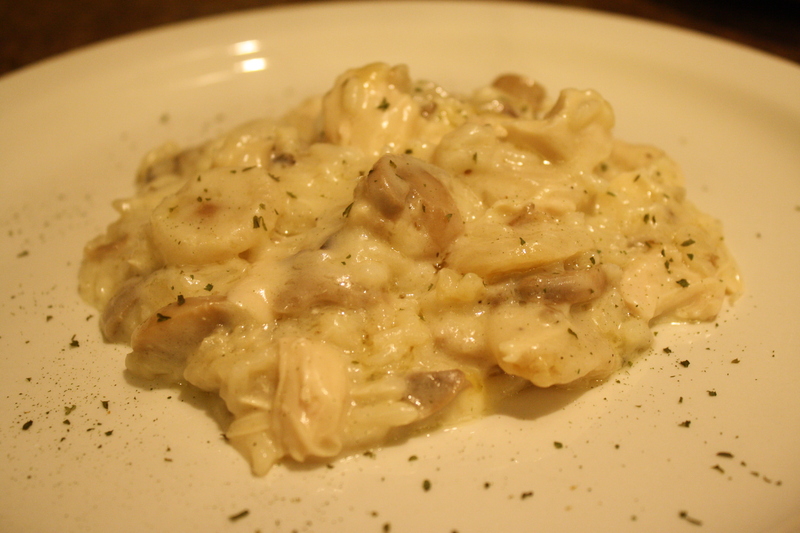 This dish was so perfect for this bleh day that I wanted to hug Mr. Opinionated and celebrate the moment. He thought I was crazy. I for sure would have hugged Trisha if she had been in my kitchen. I think she and I would get along splendidly. So, I thought I had something special. About three years ago, a book club friend of mine made a strawberry cake that my daddy just loved. She was nice enough to share the recipe with me. As I have told you before, I don’t share my best recipes. I am a recipe snob. Luckily, she is a nicer person that I am, and I have made her strawberry cake many times since. Once, I even won “Best Tasting Cake” at a dessert contest at church.Not to brag, but it was a shining moment for me. I hope that someday that victory will be listed in my obituary. I have also made it several times for work where colleagues have asked for a copy of the recipe. This strawberry cake recipe was one to save and not share. I can almost make it from memory. It is easy and yummy. 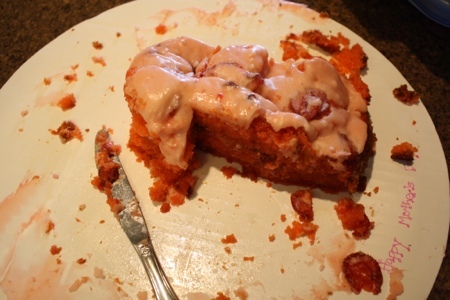 The last strawberry cake I made (other than the one I burned the other day) for Mother’s Day 2012. So imagine my surprise when I was looking through my brand new cookbook by one of my new favorites, Trisha Yearwood, and I came across her strawberry cake which is almost exactly like my/my friend’s strawberry cake. Oh, well. I guess the moral of the story is that I can’t hoard all the recipes. I must learn to share. However, I am a slow learner. I will tell you this: in the recipe I use, the cake has a whole cup of oil instead of 2/3 of a cup. The best strawberries, in my opinion, are the frozen and sliced kind instead of fresh. 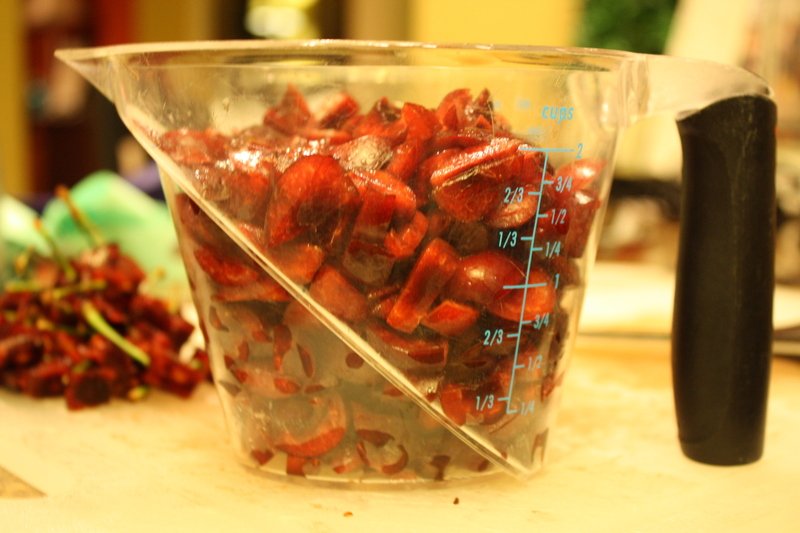 The frozen strawberries are so much sweeter, and a small container of them will make two cakes. 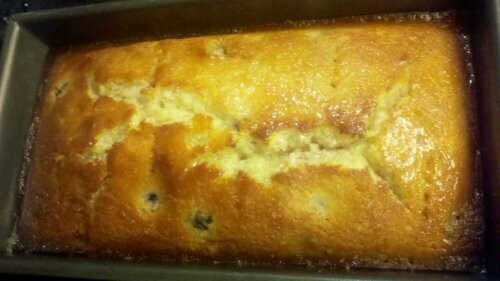 Also, this cake is better when made the day before it will be served and stored in the refrigerator overnight. 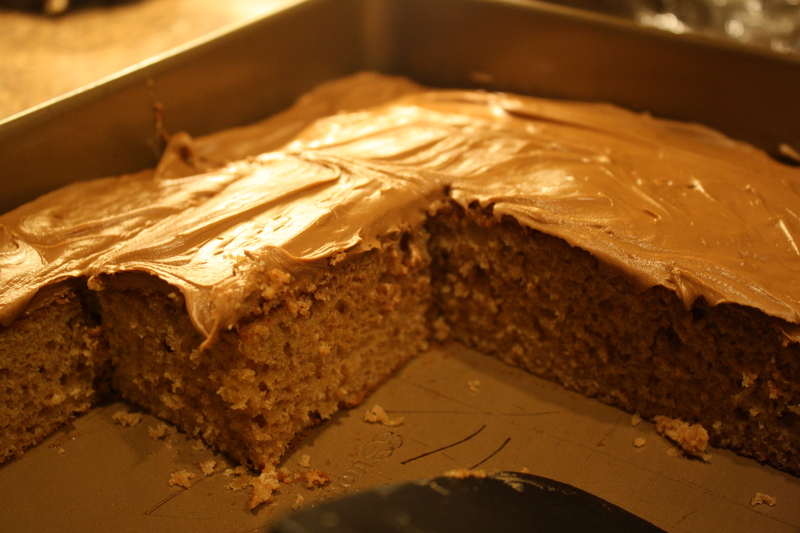 It is best as a sheet cake so the icing doesn’t run, but I have layered it plenty of times and it has been fine. One of my favorite traditions this time of the year is the annual Christmas progressive dinner we host for the junior high girls from our church. They are so sweet and awkward and fun. Some years, they eat. Some years, they just look at each other. One year, they scattered all over the house and went through regions not meant for guests’ eyes. Often, they sit down at the table and don’t move. Any way, it is a ton of work, expense, and time. But, I love it. This year, we repeated a theme we have had before. We served the kids Italian. I made homemade fetticine with homemade Pomadoro sauce, homemade meat sauce, homemade lasagna, homemade meatballs, and one of my favorite dishes of all time, Trisha Yearwood’s homemade spinach and chicken casserole lasagna. It took me all day to prepare. 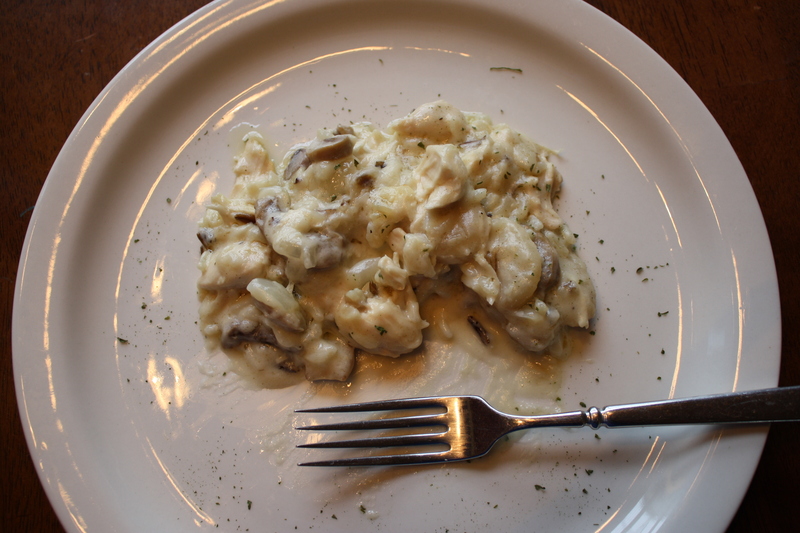 I also served them alfredo out of a jar from the store and Sister Shubert’s rolls with garlic butter. Those took about two minutes. Well, it wasn’t what took me all day, that’s for sure. It was still a lot of fun. They were so sweet and funny. They talked and laughed and ate the stuff I bought at the store. Next year, we’ll have Mexican. Probably mostly from a jar.